A few of the beloved characters in Wonderland make cameos in The Imagination of Lewis Carroll, but William Todd Seabrook focuses the chapbook on Carroll’s life outside his writings. As the collected shorts reveal, however, this separation is not entirely possible. We see Carroll split between two lives, that of logician and deacon Charles Lutwidge Dodgson and that of the household name and pseudonym Lewis Carroll. We quickly see that he feels his true identity is as Carroll. Seabrook is not writing biography. The shorts break into the fantastic and the satirical, creating what might be described as biography-fueled imagination. We see Carroll as prankster, chess player, game inventor, dueler, opium user, photographer, and control freak. We see his inappropriate attachment to Alice Liddell. We see him run from the Jabberwocky and recoil from the Dodo, as the Red King lurks in the corners. Appropriately, the book often dwells in nonsense, strange logic, and dark humor. Carroll’s watches include one the runs fast, one that runs backwards, one stuck at 8:34 that he checks twice a day, and one made of paper gifted to him by Alice. When he mistakes a public execution for a public performance, he bursts into applause thinking, “What great minds we have…to come up with such delight.” He gives a three-day sermon that ends in a two-minute amen. When a Bishop tells him his jokes alone won’t get him into heaven, he replies, “That is if you assume that this life is not already a joke, Your Excellency.” And one short is written entirely backwards, the title mirroring the previous page. 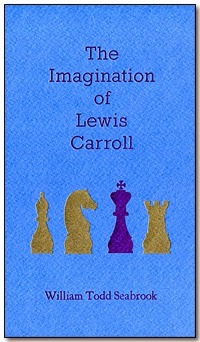 Purchase The Imagination of Lewis Carroll HERE.